The latest APK version of Xibo for Android can be downloaded from the Download Centre. The latest APK can be built and downloaded from the Customer Portal. All White Label builds are initially set to “Latest” and are rebuilt automatically on the day of release, ready for download. Please note: If you have set a specific version you will need to manually choose the new release and then run the build. Please note: From 1.8.12 if you have different models of Player that need different Player Versions on the same CMS you will need to create a Display Profile for each Player type. This can be easily done by using the Display Profile Copy button on the Display Settings page. Use the category selector to choose the standard Xibo for Android Release file, available from the Download Centre. Once the APK file has been downloaded, click on Player Versions under the Displays section of the CMS Menu, and click on Add Version. Once the APK file is uploaded to the CMS navigate to Display Settings and click on the row menu of the selected Display Profile. Click on Edit and go to the Advanced tab on the Edit Profile form. Use the Player Version drop-down menu and select the Player Version file and click Save . 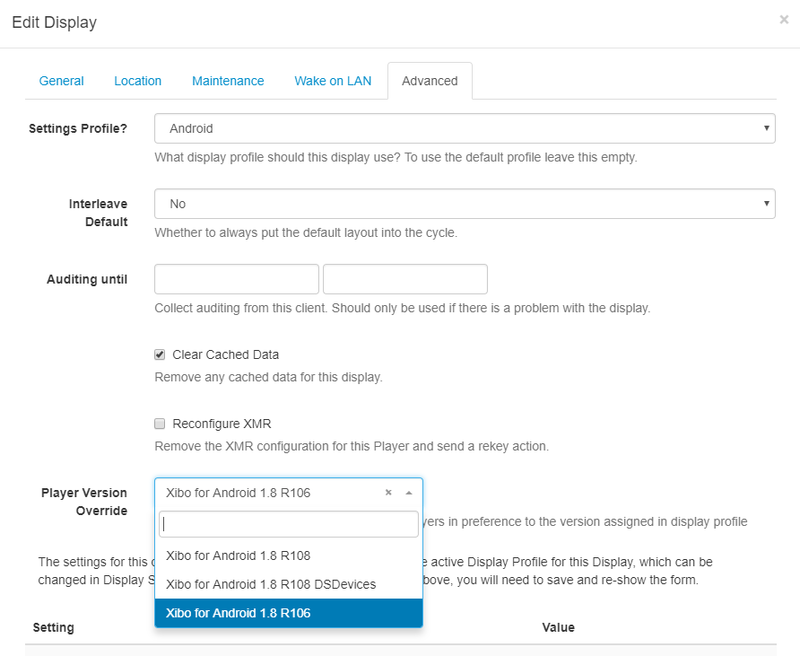 All Displays that are assigned to this Display Profile will download the new version and install it during the configured download and upgrade windows. You must ensure that the version you select is suitable for all Players that have that Display Profile assigned to them. For example, you cannot switch between two different White Labelled Players or between White Label and Xibo branded Players, or between system signed versions of the Player by this method. Attempting to send an incompatible Player version may cause errors at the Player. If you need to override the version assigned to a particular Player, that must be done before selecting a version in the Display Settings profile. Please see Player Version Override below. Please note: The Version and Code number of the installer file are populated and should be correct. If this is not the case, they will appear in red as shown in the above screenshot, and will need to be manually edited to correctly match. Use the row menu to Edit. It may be necessary to run a different Player Version on selected Displays, this can be achieved by using the Player Version Override . This must be done before selecting a Player Version in the Display Settings Profile assigned to the Player otherwise it may download and upgrade as soon as the Display Settings Profile is modified. Navigate to Displays and use the row menu to Edit . Click on the Advanced tab and use the Player Version Override drop-down to select the version to assign to the Display, click Save at the bottom of the form. All Settings for a Display, including the current Player Version assigned, can also be viewed below the Player Version Override field. Upload the new APK file to the CMS Library, using the same way as you would upload any other Media file. Once uploaded to the CMS, navigate to the Displays or Display Group page and use the row menu for the chosen Display/Display Group and click on Version Information. Once downloaded, your Player will automatically restart and update the version for Xibo for Android. After an update, you can check the Current Player Version for Displays/Displays Groups in the CMS using the row menu and clicking on Version Information as mentioned above. 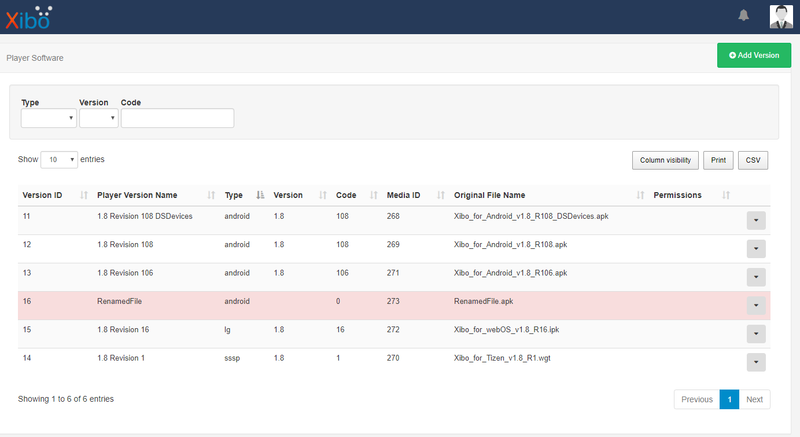 Use the category selector to choose the specific Xibo for Android - DSDevices(DSCJ18/19) Release file, available from the Download Centre. Once the APK file has been downloaded, click on Player Versions under the Displays section of the CMS Menu, and click on Add Version . Please note: All Settings for a Display, including the current Player Version assigned, can also be viewed below the Player Version Override field. Use the drop-down list and select the uploaded file and click Save. It isn’t possible to remotely upgrade this version. You will need to manually uninstall the version you have and install the DSDevices specific version of the Player for DSCJ18/DSCJ19 devices following the Installation Guide. A device that has root access can make use of the auto-update functionality which is available from 1.7 R53 and later. A Rooted Device must be configured for Automatic Update as described in the Installation Guide. Download the APK directly onto your device, or transfer it to the device using the same method you used for installation. Once the file is on the device, select it to launch the upgrade. Press OK to complete the upgrade, once finished launch Xibo for Android. Android client restarting in a loop after remote upgrading! Help! Can we update version 1.2.2 to version 1.7.8 or does 1.7.8 need to be freshly installed on the host server?